Representing the rich cultural exchange and collaboration between Korea and the UK, The Place is collaborating with the Korean Cultural Centre in London to present a festival featuring performances by five Korean dance companies. 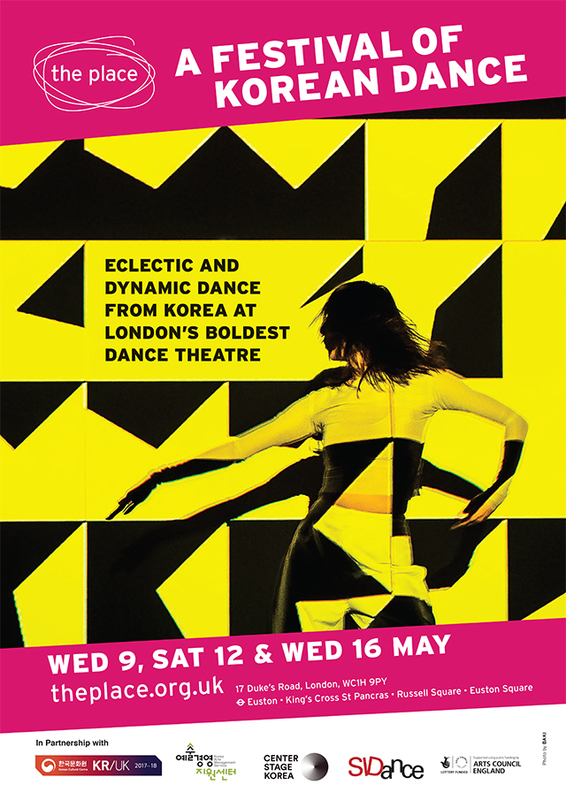 This a chance to experience the diversity of the Korean dance scene, from contemporary to hip hop, including the first-ever UK appearance by the Korean National Contemporary Dance Company. Making their UK debut the celebrated Korea National Contemporary Dance Company present the beauty of Korean dance and music on stage. <Immixture> is a perfect harmony of speed, strength, flexibility and precision performed by five virtuosic dancers who skillfully blend traditional Korean dance and music with vibrant Western melodies and movement. As one of Korea’s pivotal national performing arts companies, and the country’s top production company of contemporary dance works, Korea National contemporary Dance Company focuses on producing new works and continuously developing and advancing the company’s repertoire. Based on a systematic and stable production system, KNCDC works with talented Korean choreographers and artists and enriches its programs further by inviting internationally acclaimed choreographers and pursuing other international collaboration. KNCDC enhances its artistic prowess further by offering an environment for the creation of new works to enrich the repertoire with artistically exciting, diverse and unique pieces. Ahn, Sung Soo utilises a genre-encompassing approach in his creation, with elements from Korean traditional dance, ballet, hip hop, contemporary dance and elsewhere. Identifying and separating characteristics of each type of dance, he breaks them down and uses the core elements to reconstruct, building each new work with its own visual aesthetic, systematic structure and musical interpretation. He also seeks to build on the diverse qualification of the Korean dancers with the delicate interpretation, outstanding musicality, unique texture and versatile technique earned through their body neutralisation training. Under his artistic leadership, KNCDC aims to introduce the vibrant originality and excellence of Korean contemporary dance to the worldwide dance stage. Wed 9 Mar Stay after the show for a Q&A with the artists. The first word from James Joyce’s notoriously difficult avant-garde novel Finnegan’s Wake provides the title for dance and choreographer Jin Yeob Cha’s spectacular solo. Against a psychedelic backdrop created by visual artist Vakki, Jin Yeob Cha explores new function and meaning through dynamic movements in this multi-dimensional performance. Jin Yeob Cha is the artistic director of Collective A. Cha has worked with many international companies including Hofesh Shechter Company (UK), Galili Dance Company (Netherlands) and English National Opera productions (UK). She received numerous awards, including 2014 Young Artist of the Year Award : Minister of Culture & Arts Merit Awards from the Ministry of Culture, Sports and Tourism. She was commissioned as a choreography director of the PyeongChang 2018 Olympic Winter Games, choreographing the opening and closing ceremonies. Vakki is an artist who explores various media ranging from graphic design, kinetic installation, video, to interactive media. She geometrically interprets the process of moving and creates objects in a given orbit, questioning the cycle of existence through kinetic work with graphics and motility. In South Korea exceptional male dancers who win the illustrious Dong-A Dance Competition are rewarded with exemption from mandatory military service. Using humorous dance theatre award-winning choreographer Lyon Eun Kwon, draws on the male performer’s personal experience and connects two connotations of glory – the one known through serving your country verses the one obtained through avoiding military service by winning a competition. Lyon Eun Kwon, is a choreographer and dancer based in Seoul, Korea. She won The French Embassy Prize for Young Choreographer for The Skill for me at the 2014 Yokohama Dance Collection EX in Japan. Homo Knitiens was presented as a showcase format at Centre National de la Danse Paris and invited to Dance Cross, Yokohama and Seoul Performing Arts Festival (SPAF). Her latest piece Glory won the Third Prize and the Audience Prize Special Mention at the Danse Élargie in Paris, 2016.